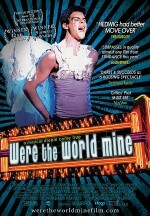 C - The most striking aspect of Tom Gustafson's determinedly affable queer high school musical, Were the World Mine, is the slick manner in which the director grafts his lightweight contemporary political message to the elemental bliss of his source material. That would be A Midsummer's Night Dream, for which the film has the dreamy reverence of an enthralled sophomore literature geek (appropriately enough), but also a scrappy grasp of its timeless themes. Thus, Gustafson is able to juggle an obligatory liberal scolding of intolerance alongside the play's more traditional facets: the giddy thrill of romance, the tragicomical nature of human relations, and a certain meta-textual impishness. Unfortunately, this nimbleness is nowhere else to be found in Were the World Mine. The amateurish acting aside, Gustafson just isn't that skillful of a director, and the clumsy editing, sound, and choreography in particular make for some frustrating and baffling stretches. One wonders what Julie Taymor might have done with the concept and a $30 million budget. Still, Gustafson's enthusiasm for the material and his cast shine through, and Tanner Cohen as the tale's Puck / Helena propels the film with his alluring looks and soaring voice.